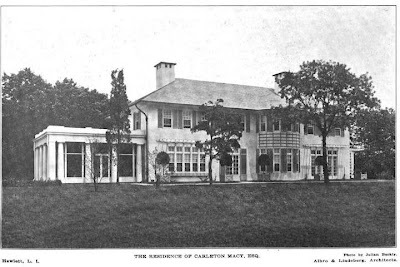 'Meadowwood', the Carleton Macy residence designed by Albro & Lindeberg c. 1908 in Hewlett. Macy was the president and general manager of the Queens Borough Gas and Electric Company from 1903 to 1927 and developed property in Hewlett. 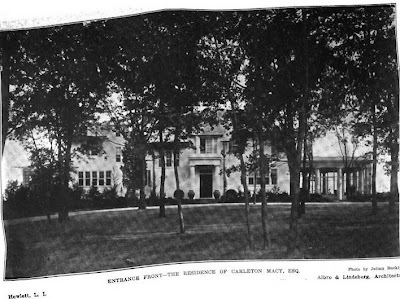 Macy was a cousin of V. Everett Macy who also had Albro & Lindeberg design him a house in Hewlett the same year, which can be seen HERE. Click HERE to see 'Meadowwood' on google earth and HERE on bing. 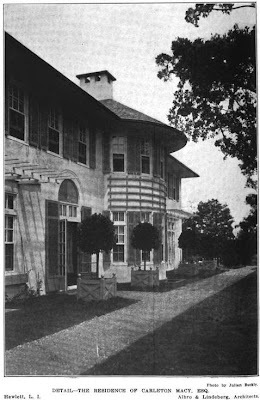 Pictures from Architectural Review, 1910. Albro & Lindeberg, to my mind, were among the most interesting country house architects of their day. Very interesting house. It's still standing at 1261 Veeder Drive in Hewlett Bay Park. The house has been enlarged but you can still recognize the original architecture, particularly the rear elevation. is that pile beyond the house an estate converted to a school or was it always a school? Unfortunately, 1261 Veeder had been torn down, and a monstrosity had been built in its place. I don't know how one does that. Would anyone happen to know if there are any other records of the original homes in Hewlett Harbor or Hewlett Bay Park. I'm interested in buying in the area and restoring historical homes. Would love to find one that is still pristine. The original house at 1261 Veeder Drive by Albro and Lindeberg still stands. I know so because I'm living in it! The home next door to us was torn down, and a new home has gone up, which is probably what you're referring to in your post of January 20, 2014.